You are here: Home » Custom Jewellery » Which metal should you choose for your engagement ring? In the world of engagement rings, a huge amount of focus is placed on the diamond. This is completely understandable as, after all, the diamond is the focal point of the entire piece, as well as the most expensive component of any item of jewellery. It is important to keep in mind though, that the other parts of a ring can play just as big a part in the overall look, with the metal you choose having perhaps the most significant impact. 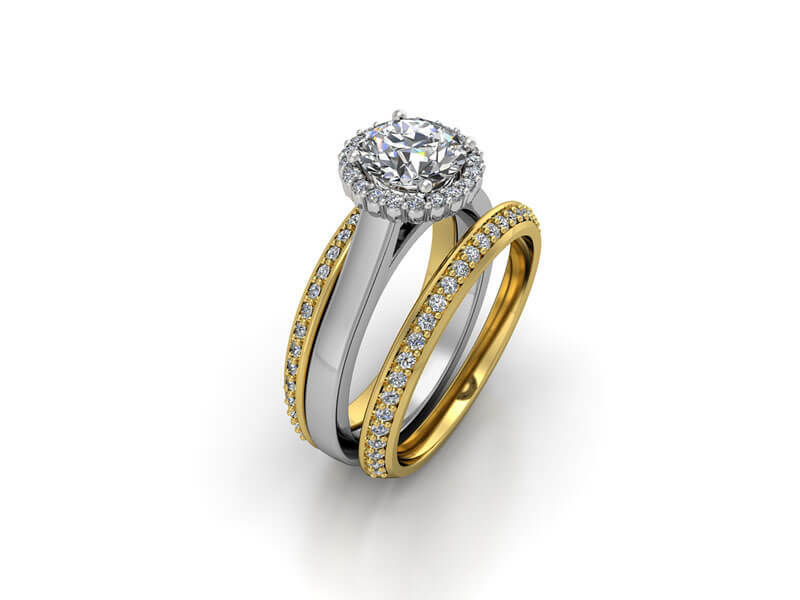 In this article, we’ll take a look at three of the most common choices for engagement ring metals. Gold, silver and platinum are some of the most popular metals for jewellery. Historically the most popular metal in all forms of jewellery, gold has a classic look that appeals to everybody. It’s also incredibly versatile, and can be used in everything from electronics to dentistry. In the jewellery business, gold is typically combined with other metals to form an alloy. This gives the metal a more durable finish that allows it to better withstand heavy use. As a side effect of creating these alloys, there are several different colours that gold can take. These range from a classic yellow gold through to more exotic rose gold, and the colour option that you choose can have a big impact on how a finished piece will look. A common example is white gold, which is actually yellow gold alloyed with palladium. This results in a greyish white colour, which is further lightened with rhodium plating to give a stunning and bright finish – although you may need to re-plate the metal every year or so to maintain this. Like gold, silver is too soft to be used if it is completely pure. To get around this, jewellers use sterling silver, which contains a small amount of copper. This strengthens the metal, but doesn’t dull the brilliant metallic sheen that is so highly sought after. Silver has a very modern look, which can be great if you’re looking for a particular aesthetic, although it is worth noting that this metal can tarnish more easily than others. Platinum is incredibly durable, but is still more than malleable enough to be worked into very fine pieces. More than 30 times rarer than gold, platinum is the undisputed leader of the precious metal world, boasting the appearance of white gold but without the need for rhodium plating. The substance is expensive and exclusive, but its gorgeous appearance and unique characteristics make it perfect for jewellery. For example, platinum is incredibly durable, but is malleable enough to be worked into very fine pieces. These characteristics mean that you can wear platinum jewellery every day, even if they seem delicate. Whichever type of precious metal you choose, make sure to compliment that choice with an appropriate stone, and of course a custom design. Get in touch with Joseph George today to find out more.